I’m discovering a passion for using leftovers. Even when I am cooking something, I am thinking about what I’ll be able to make that last uneaten portion into. Frugality at it’s best I like to think. Last week, Jacob made some lamb and couscous for dinner. The lamb was perfect. So was the couscous. But there was a lot of it! He had made it with a mix of onions, garlic, silverbeet and currants. So yummy! The next day, I had over a cup leftover in the fridge. 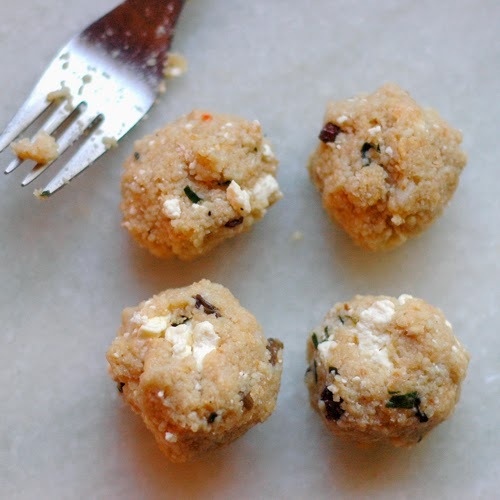 So, I did what people tend to do with quinoa and such, Fritters! 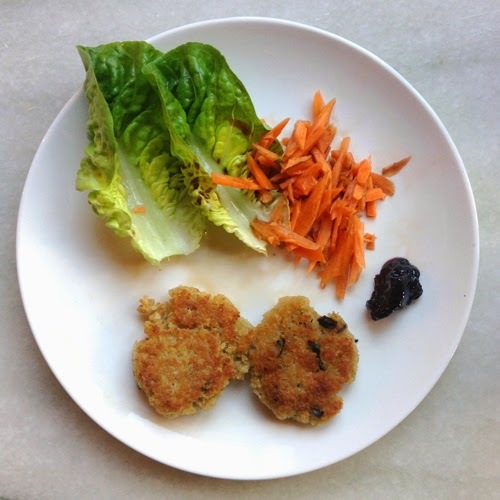 Couscous Fritters, baby cos lettuce with carrot ‘slaw’ and blackcurrant jam for dipping. If you know how to make fritters, you can really make them from anything. Potatoes, kumara, mixed veggies, lentils, beans beans and more beans. It’s all a bit to easy not to try. First, whisk the egg then mix in your couscous. Add in the breadcrumbs slowly, a little at a time and mix. You may need less or more depending on the texture of the couscous and what is in it already if you are using leftovers. Add in the feta and let it crumble a bit and keep some pretty chunky. I love the texture of big bits of melted feta. Next, you want to be able to make them into balls with your hands and have them stay together. If this isn’t happening and it’s still too wet, add more breadcrumbs. Heat up the pan with a bit of oil. I used regular canola oil for this one, but tend to do grapeseed oil when frying. 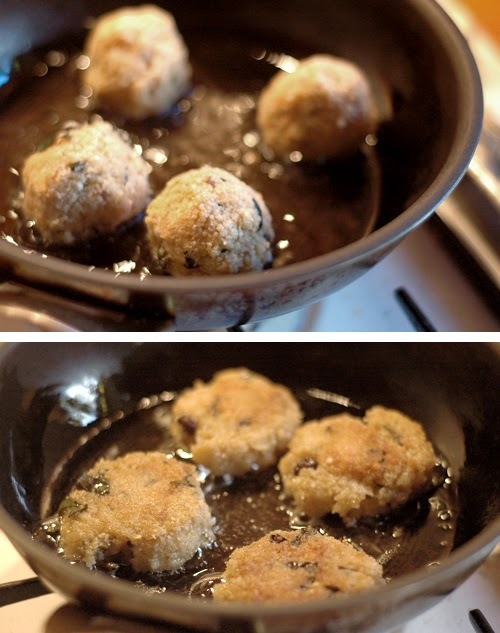 Pop them into the pan and let them brown a little bit and then turn them and flatten a bit with a fork or a spatula. They should be browned a bit on each side, it’s just the egg you need to make sure cooks through, so it usually won’t take any longer than 4-5 minutes on each side. Drain them on a paper towel and serve ’em up! I was secretly hoping the boys wouldn’t like them so I could have the whole lot, but no such luck. They were, sadly, a hit. First, whisk the egg then mix in your couscous. 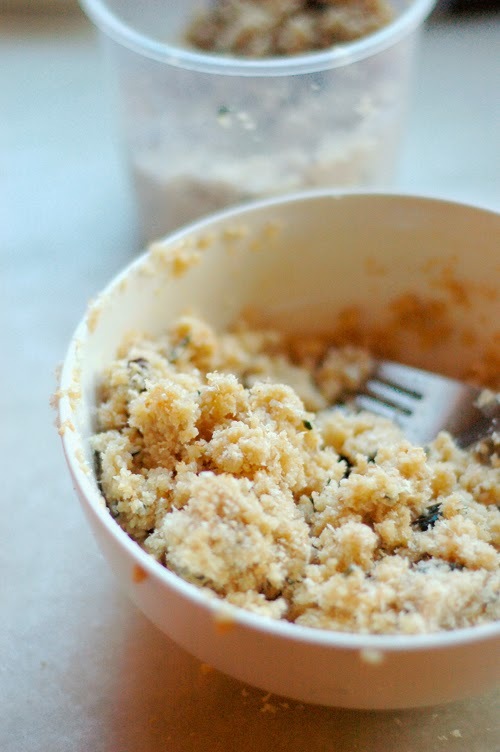 Add in the breadcrumbs slowly, a little at a time and mix. You may need less or more depending on the texture of the couscous and what is in it already if you are using leftovers. Add in the feta and let it crumble a bit and keep some pretty chunky. You want to be able to make them into balls with your hands and have them stay together. If this isn’t happening and it’s still too wet, add more breadcrumbs. Drain them on a paper towel and serve ’em up! Next Post Spring…… Where are you! ?